Ciaran Clark says the Ireland squad must focus on the task at hand despite the high-profile absences of Harry Arter and Declan Rice. Ciaran Clark pictured at today's press conference. 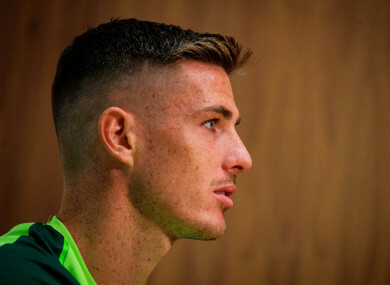 IRELAND DEFENDER CIARAN Clark says the side are determined to focus on the task at hand, rather than dwelling on any high-profile omissions from the current squad. In addition to injuries to Shane Long, Scott Hogan and Sean Maguire, as well as long-term absentees James McCarthy and Robbie Brady, Harry Arter and Declan Rice have made themselves unavailable in recent days for the upcoming Nations League match with Wales on Thursday, as well as next week’s friendly with Poland. Rice is considering switching his international allegiance, having held talks with England boss Gareth Southgate recently, while O’Neill said today that Arter wanted to focus on his club career and suggested a row with assistant boss Roy Keane was part of the reason for his decision. “Obviously everyone is aware of the situation, but we have come in now, we’ve had our first training session and everyone’s head is focused now really on the game coming up,” Clark said. Pressed on the Arter situation, Clark added: “It’s something that he has to sort out himself. It’s hard for us, really. We are trying to concentrate on the games. There’s a lot of different things going off outside and all we want to do is just concentrate on the football, really. And unlike Irish team-mate James McClean, who sent a text message to Rice in the hopes that it would persuade him to remain with Ireland, Clark — who himself represented England at underage level before switching his international allegiance to Ireland — said he never felt any temptation to intervene in the saga. That’s down to Declan, that’s a decision that he’s going to have to make himself, and the same with Harry. While his club Newcastle have had a disappointing start to the season, having picked up just one point from their opening four games, Clark appears to be in better position as an individual compared with last season. The 28-year-old centre-back made 20 Premier League appearances for the Magpies in the 2017-18 campaign, but fell out of favour and didn’t play a single match at club level after their 1-1 draw with Crystal Palace on 4 February. This season, however, Clark appears to be back in manager Rafa Benitez’s good books, having started all four of his side’s top-flight matches so far. “Every player wants to play games, train hard. I’ve been able to play a couple and it’s obviously nice for me. Email “'It's a massive game and it's obviously disappointing the lads aren't here'”. Feedback on “'It's a massive game and it's obviously disappointing the lads aren't here'”.